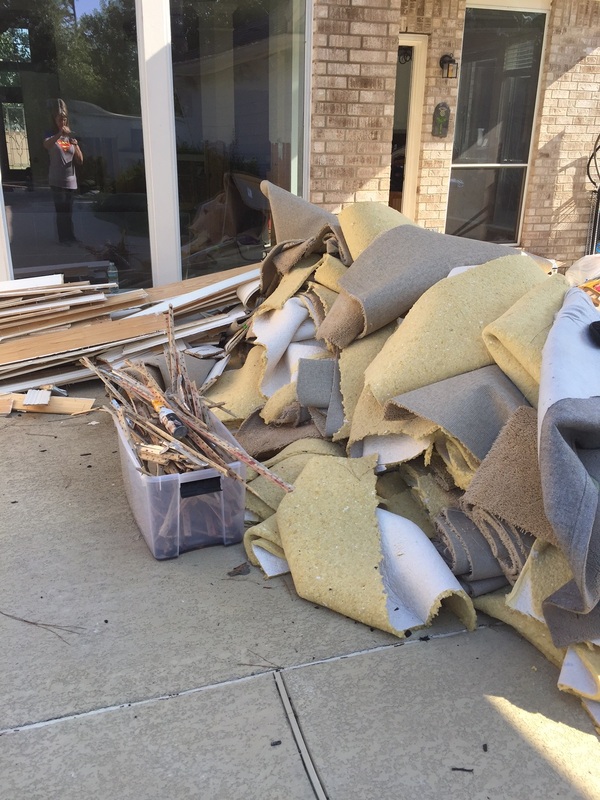 Hurricane Harvey brings devastation, but also acts of kindness and reminder about the need for insurances! Monday 28th August 2017 – I was woken at 6am by flashing lights and the sound of what turned out to be a rescue vehicle taking some of my neighbours to dry land after Hurricane Harvey hit Houston. It had been raining hard since Friday and the water level in the street was about waist deep. The night before, we had barricaded the doors and moved what we could upstairs and went to bed thinking what will be will be. At first, the damage didn’t seem that bad, it was only a couple of inches of water after all! Then I squelched my way across the carpet and realised that the base boards were divorcing themselves from the walls and the dry wall was no longer dry and there really shouldn’t be flip flops floating across the hallway. The reality of how much damage 2 inches of water can do began to sink in. My immediate thought was how I wish I had gotten round to buying flood insurance. Like 85% of the people who got flooded during Hurricane Harvey, I hadn’t paid the additional $400 for flood insurance. I wasn’t in a flood plain! How stupid did I feel! However, after taking a very deep breath, we started formulating a plan! Carpets and underlay were removed in small pieces (wet carpet is very heavy and smells a lot like wet dog!) but the water was still seeping into the house through the weep holes in the walls. 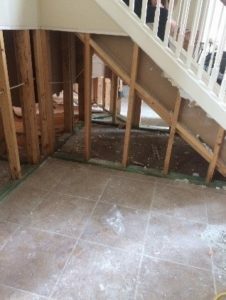 It was obvious that we would have to wait for the water level to recede before we could get started on the real demolition. 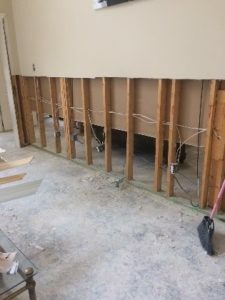 By Wednesday, the water level had dropped enough to allow access to the street, so along with some destructive friends (including our very own CTO Annabel Green who got stuck in Houston due to the flooding), we got to work! We were making slow progress and coming to the conclusion that none of us were used to physical labour when around 6 total strangers appeared at the door wielding sledge hammers, crow bars, 10lb hammers and other miscellaneous tools of destruction. Under normal circumstances, I would have called the police but these kind souls were here to help with no expectations other than a cold beer at the end of it. Within a few hours, the open plan concept had been taken to the extreme! I thanked the strangers from the bottom of my heart for wrecking my house and they picked up tools and moved on to the next disaster zone! Turns out that this sort of act of kindness is what people do in a crisis. During the days that followed, many unpaid demolition crews including football teams, scouts and church groups were helping endless households in trouble. People could be seen driving around handing out pizza, beer, cleaning supplies and helping in any way they possibly could. Families were welcoming strangers made homeless from the floods into their homes and donating provisions to the thousands of displaced households. Nobody wants to be in this situation but the feeling of community spirit is heartening. Our house is now free of water (and walls) and the wood has dried out and I tell anyone who will listen to get round to buying flood insurance. Next stage is getting a contractor to put it all back together again! Watch this space! !